Who would have thought we'd get to 100 back on July 27, 2011 when we had our very first pitch? This, my friends, is a Brookie - a Brownie Cookie - pretty much the best of both worlds, don'tcha think? Because the 100th day of anything doesn't come around all that often, I think I will give away a prize to one lucky randomly selected commenter from today's post! Just because I love you and my blog would be nothing without all you wonderful people who come to read and comment and share your love of kidlit. Hmmm.... what should the prize be, I wonder? Well, you can never really have enough picture books, can you? :) If you're a parent or a teacher they come in super handy. If you're a writer, you can learn so much from how a good one is written. So how about the prize shall be the winner's choice of Is Your Buffalo Ready For Kindergarten by Audrey Vernick (perfect for this time of year), I Haiku You by Betsy Snyder (perfect for poetry lovers), Journey by Aaron Becker (perfect for art lovers), America's Champion Swimmer: Gertrude Ederle by David A. Adler (perfect for nonfiction lovers), or, if you already have all 4 of those, something else that we pick together! Straight From The Editor reminds me that I don't think we've done the July Pitch Pick, so maybe I'll put that up on Friday. Now then, today's pitch comes to us from Lisa, whom you may remember from last month with her pitch for That Tommy Thompson. Lisa says, "I'm a former elementary school social worker, mom of two, and have recently made writing my full time job. Two years ago I wrote my first picture book and just this past fall I decided it wasn't going to do any good sitting on my computer. I began taking classes, reading craft books, attending conferences and workshops and just writing, everyday, writing. The original story is long gone but at last count I've got 42 other drafts and ideas jotted down. Oh yeah, and about four or five ready to go manuscripts. I have worked with kids my entire adult life and I feel strongly that this is the avenue in which I am meant to reach those little hearts and minds at this time in my life. On a random note, I'm a big fan of chocolate covered gummy bears. ;)"
The Pitch: The sight of a golden egg creates quite a stir among the feathered community and the fact that it doesn't hatch has the Whisperers working overtime. But have no fear, the Eggsperts are called in to save the day. But do they? In the end, Mother Hen knows she must listen to her heart. Through a humorous story, lies a nurturing tale about a mothers love, acceptance and healing. Lisa is looking forward to your thoughts on her pitch! I am looking forward to seeing how my freshly updated website and blog turn out. The marvelous Donna Farrell is hard at work trying to update, freshen, and streamline my blog and website with only the barest, minimal, cryptic information from me - such comments as, "Can you make it so it does that thing like, you know?" - very specific, detailed instructions :) Good luck, Donna :) But she's a genius so I know it will turn out exactly how I want it! Have a wonderful Wednesday, everyone! And don't forget, one lucky commenter today will win a prize! :) Thank you all for your devoted readership! It makes me happy to be part of this warm-hearted, generous community! Congrats on 100 and awesome giveaway! Way to go Andrea too! Great pitch, I would just take out the last line. Woohoo...Susanna! 100th on a fine and popular tradition...how wonderful! Congratulations to Andrea! That's quite the accomplishment. I'm a sucker for anything chicken related, so I would read this story. I agree with Catherine that the last line can be taken out (if it isn't, it needs some fixing...extra comma, lack of apostrophe). Also, when I hear/see the word "whisperer" now, I think of people who can communicate well with another species (e.g. horse whisperer), so I would suggest changing "Whisperers" to "Gossipers." Yay for making it to pitch 100! That is quite the milestone. And two thumbs up for Andrea. I agree, get that pitch out on submissions ASAP! As for today's pitch, I would read it but I was a little confused because I wasn't sure if the golden egg just happened to be alone or if it belonged to Mother Hen due to the mention of Mother Hen listening to her heart. Otherwise, it sounds really adorable. Centratulations, Susanna! I've obviously missed too many! And to Andrea, that's wonderful. Now, hurry up and sub! I have to agree with Catherine about the last line too, and I would try to tighten it just a wee bit more, possibly even cutting the first three words. Best of luck, Lisa! Congratulations Susanna. That is awesome. Happy 100! Hi Lisa, wow 42 MS, that is great. As for this story my answer is a maybe. While I like humorous chicken stories, I am not exactly sure what this story is about. I actually thought the story was about a chicken miscarriage. Okay just re-read and realized it's a golden egg so it won't hatch obviously. Does Mother Hen treat the egg as if it were a real one? Not sure where the healing part comes into play. I am curious about the story as I do love your voice with words like Eggspert and Whisperers, just a bit confused. Congratulations Susanna! That's great for you and for us! Congrats to Andrea for such a wonderful pitch in June! Awesome! The pitch had me going with the first sentence, so I would read it for sure. I would tighten some. I am thinking the Eggsperts and the Whisperers are one in the same? If I'm wrong ignore me :-) If they are one in the same, I think you should combine the two sentences. Are they Eggspert Whispers? (I love both of those words for your story, by the way!) Right now it sounds like they are two different groups. And I agree with Catherine and others to delete the last sentence. relatable to adults than to children." :D Best of luck! The pitch - I love that it's a hen, and that there are "whisperers" and "eggsperts". Sounds just like my small town. Could it be the neighbors seeing this golden egg and gossiping? Next thing you know they're calling in snarky comments to the reader's column and penning letters to the editor (quill pens, of course) - and who calls in the eggsperts? I think mama hen has to save the day, not the eggsperts - who will prolly end up with egg on their faces. You have to try the gummy bears! Mama's always save the day! Thanks for the comments! Thank you for the feedback. I will check out the article. I'm hoping it is a story that kids and adults can take away some lessons from. The golden egg has a few siblings that keep things interesting as well! The last sentence is out! I agree. Thanks for the feedback! Thank you! I like the Whisperers and Eggsperts too! Ha, well only 5 or 6 completed MS. The rest are notes, ideas and partials but I always have something to work! Thank you for the feedback. Last line is gone! I thought about deleting it last night but got so tired after just doing the Komen 3 day I didn't even have energy for delete. ;) Thank you for the feedback! I would read it. I'm intrigued by the golden egg and what all the whispers are about. Thank you for the feedback. I will think about how to make that more clear! I never thought about that with the Whisperers. Something I will have to consider. Thanks for the feedback! I agree. Last line is gone. Thanks for the comment! The muffin is perfect, Susanna! Thanks for always providing us with a little visual taste of paradise. :) And your blog site is already awesome...excited to see what the changes will be. The barnyard is all a-flutter and feathers are flying when the Eggsperts are called in and advise (one or two examples of what they think should be done), but in the end, Mother Hen knows she must listen to her heart. I like the pitch a lot. It grabs my attention and I like your play on words. I'm not sure I'd use the last sentence in the pitch. Sounds more like an opening first paragraph about the length of your book along with a comment summarizes the book -- which the last sentence does. I like the use of whisperers. Congratulations Andrea on the feedback. I'm with Patricia on the last line. Good luck to Lisa on the pitch, Andrea on her feedback. Susanna on the website and ... oh I want that cookie Brownie Coleen. Yummy. Yup. I agree with the others. Perfect pitch except for the unnecessary last line. Congrats on reaching 100, Susanna! Umm, *drools*. That Brookie looks 'to die for'! Yumm! I really liked this pitch, and would definitely read the book. I do agree with Patricia about the last line. It felt so adult. And I thought the line before it ended the pitch nicely. Best of luck with the book and your new career, Lisa! Woo hoo! 100 Would You Read it Wednesdays! Congratulations! I see we are all in agreement that the last sentence should be eliminated. The humor is obvious in the wordplay and the premise. I think the pitch works eggcellently up to the last line. Great job, Lisa! I really look forward to reading the story! P.S. Sorry I have been such a stranger, Susanna, but I had really lousy internet service in Maine. Sites just would not load on my iphone, or they'd load for a but then the service would disappear. Frustrating- but on the flip side , it's good to unplug sometimes :-) Missed you! Happy 100! The brookie seems a worthy celebration dessert. (YUM) As for the pitch, yes, I would read the PB, though I agree the last line is not needed. I would also delete the first three words of your first sentence. Woo Hoo!!! Way to go, Andra. That is great news about your Backpack Pitch. Happy 100th Pitch Pick, Susanna. Time flies when we're eating chocolate. We started the celebration early by capping off our evening (last night) with ice cream ~> toasted waffle, spread with Nutella, topped with vanilla Haagen Daz, strawberries, and bananas! Yes . . . it's GOOD! Sinfully so. 100 pitches! That's great, and a yummy brownie cookie to boot! Congrats, Andrea, on that great feedback. As for the pitch, I like it, but my initial reaction is that it's too long. A quick glance at others' comments seems like that's already been said, and how to fix it. Nice job! Thanks for the congrats, Catherine - you're very sweet! - and thanks also for your comments for Lisa! Thank YOU for being such a devoted Would You Read It participant, Angela! And thanks for your thoughts for Lisa! Thanks, Julie! Many of the old WYRIs are archived for your browsing convenience under the WYRI tab above, but then I got very busy and fell behind with updating so you will notice I haven't done it since about January :) Something else to add to my to-do list :) Thanks for your helpful suggestions for Lisa! Thanks for the congrats, Darshana, but they are really for all of you guys for pitching and commenting and helping each other so much! Thank you for your thought-provoking comments for Lisa, too - I'm sure she'll find them helpful! Thanks for the congrats, Pat! Although as I said to Darshana, they really belong to all of you :) And thanks for your helpful thoughts for Lisa. Oh Penny! Thank you for bringing the confetti and balloons and streamers, and you are right! Horseshoes would be perfect! Andrea certainly did do a good job on her pitch! And thank you so much for your helpful comments for Lisa! I sat down to a cup of hot coffee...but I'm waiting for the Brownie Cookie to be delivered! It definitely looks yummy! I read very quickly and it took me a couple of reads before I understood the pitch. The first sentence seemed a bit wordy...and I would definitely omit the last line. "She must listen to her heart" is the perfect ending to the pitch. Thanks so much for your congrats for Andrea and your comments for Lisa, Pat! Very helpful! Hello, my friend! I'm glad to see you again and hope you had a wonderful time in Maine! I'm glad you got a chance to unplug - I really think we all need it! Thanks for your helpful thoughts for Lisa. And I saw you had a new post up but my internet's been down all day and I'm way behind. I'll be over as soon as I can! Hello and welcome, Delighted! I'm so glad you stopped by! I would love to be able to deliver the Brookies - I'll get Coleen on the case :) Thanks for your comments for Lisa - I am sure she will find them helpful coming from a first grade expert like you! Yes to the pitch (an eggs-tra big yes?) --and Happy 100, Susanna! Yay! Using "In the end" seems like you're telling us the ending and the use of a question doesn't necessarily create suspense, so why not combine these two? Thanks, Joanne, for the Happy 100th, the congrats for Andrea, and your helpful suggestions for Lisa! No worries about the day - anytime is helpful. And my internet was down yesterday too. Terrible, isn't it? Puts you so behind! So, Martha Stewart has a recipe...but I made Betty Crocker gluten free brownie mix and divided it into a 12 cup muffin tin and then dropped a ball of BC gf chocolate chip cookie mix dough on top. Then I baked it at 375 for about 20 min. 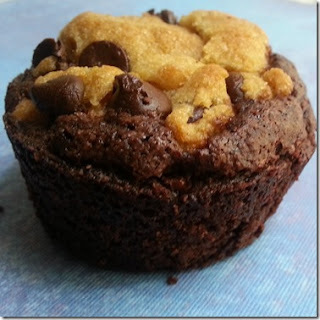 :) Basically you can use your favorite brownie and cookie dough recipes/mixes. Easy! I would read it! It piques my curiosity. I think the pitch might be stronger with a slight variation from what you have. After "But have no fear, the Eggsperts are called in to save the day." I would change it to something like: "But who knows better, them... or Mother Hen?" (Just an idea). Good luck!